BROWARD COUNTY, FL -- Real-time tides, currents, water levels and other meteorologicalinformation at Broward County’s Port Everglades is now live online or by phone thanks to an advanced sensor device developed and installed by the National Oceanic and Atmospheric Administration (NOAA). The newly installed Port Everglades Physical Oceanographic Real-Time System (PORTS®) is available on the Port’s website at porteverglades.net (top of the homepage under "Tides & Currents") or via phone at 866-213-5269 . Broward County’s Environmental Planning & Community Resilience Division co-sponsored the PORTS device as it provides valuable data for storm and climate change preparedness. 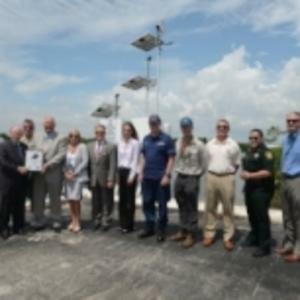 The Florida Inland Navigation District (FIND) provided a grant to offset a portion of the cost to install the equipment. “Port Everglades PORTS will give vessel operators the real-time tide and weather information they need to help them navigate these waters more safely and efficiently," said Rich Edwing, director of NOAA&apos;s Center for Operational Oceanographic Products and Services. "This is a win for the port, the surrounding communities, and every business and industry that depends upon these cruise and cargo ships." PORTS® is a decision support tool that improves the safety and efficiency of maritime commerce and coastal resource management through the integration of real-time environmental observations, forecasts and other geospatial information. PORTS® measures and disseminates observations and predictions of water levels, currents, and meteorological parameters (e.g., winds, atmospheric pressure, air and water temperatures) that mariners need to navigate safely. The installation includes a Micro-Wave water level sensor (MWWL) that is a non-contact highly accurate sensor used to measure distance and can be used to monitor long-term sea level changes. The back-up water level sensor is a pressure-based sensor that measures water-level. The meteorological station has been located on the roof of the Port’s Harbormaster Tower and is outfitted with primary back-up wind sensors that provide wind speed and direction. As one of Florida’s leading economic powerhouses, Broward County’s Port Everglades is the gateway for international trade and cruise vacations. Consistently ranked among the top three busiest cruise ports in the world, Port Everglades is also one of the nation’s leading container ports and South Florida’s main seaport for receiving petroleum products including gasoline, jet fuel and alternative fuels. The Port Everglades Department is a self-supporting Enterprise Fund of Broward County, Florida government with operating revenues of nearly $162 million in Fiscal Year 2017 (October 1, 2016 through September 30, 2017). It does not rely on local tax dollars for operations. The total value of economic activity related to Port Everglades is more than $30 billion. More than 230,000 Florida jobs are impacted by the Port, including more than 13,000 people who work for companies that provide direct services to Port Everglades. For more information on Port Everglades, go to porteverglades.netor e-mail PortEverglades@broward.org.